← Where Can You Eat Bratwurst, Sauerkraut and Potatoes In Wiener Werkstätte Style? A Welcome Wagon hostess might not have presented me with a basket of samples and coupons when I moved to Riverlea, but Mary and Peggy, two unmarried sisters in their 80s who lived next door, were a far better gift. The first night I spent the night in my new home, my new neighbors called to make sure I wasn’t afraid to stay there by myself. They invited me to watch television with them in their sunroom, to go with them to Villa Nova for all-you-can-eat spaghetti night, and to join in their Sunday-afternoon card games with their brother-in-law and their niece. And I could come over anytime to play with George, their cat. Best of all, Peggy and Mary shared my love of Hitchcock chairs, those iconic 19th-century pieces that have come to define an entire genre of home furnishings. With their turned legs, rungs, slightly curved back-slats and rounded-edged plank or saddle seats, these chairs are either painted black or finished with an imitation grain to represent mahogany, walnut, or rosewood. They are best known for their beautiful stenciled decorations, most often made with shimmering bronze powders, but other extra-special pieces are adorned with hand-painted scenes. Hitchcock chairs are the creation of Lambert Hitchcock, who was born in Cheshire, Connecticut in 1795. After apprenticing with a Litchfield chair- and cabinet-maker, 23-year-old Lambert struck out on his own in 1818 and began making his own chairs. In nearby Barkhamsted, on the west branch of the Farmington River, he converted a shed near a sawmill that was used to store lumber into a shop outfitted with waterwheel-powered lathes, boring machines and other equipment essential to making chairs. At first, he made chair parts, selling them to storekeepers, settlers and distributors in the faraway Southern states. By 1825, Lambert’s business was so successful that he expanded to producing fully assembled and painted chairs and other pieces of furniture, building a 10-room factory and employing about 100 men, women and children to produce 15,000 chairs a year, selling them from 49 cents to $1.50 apiece. Convicts in the state prison even helped Lambert by making woven seat frames and extra parts for him. New Englanders of the day made furniture out of wood from plentiful maple, birch and cherry trees. To simulate more expensive woods like mahogany and walnut, they painted or stained it in a base color like a rusty red, washed it with a coat of black paint, and partly removed it with crumpled cloths, sponges or wood-graining combs before it was dry to create a wood-grain effect. 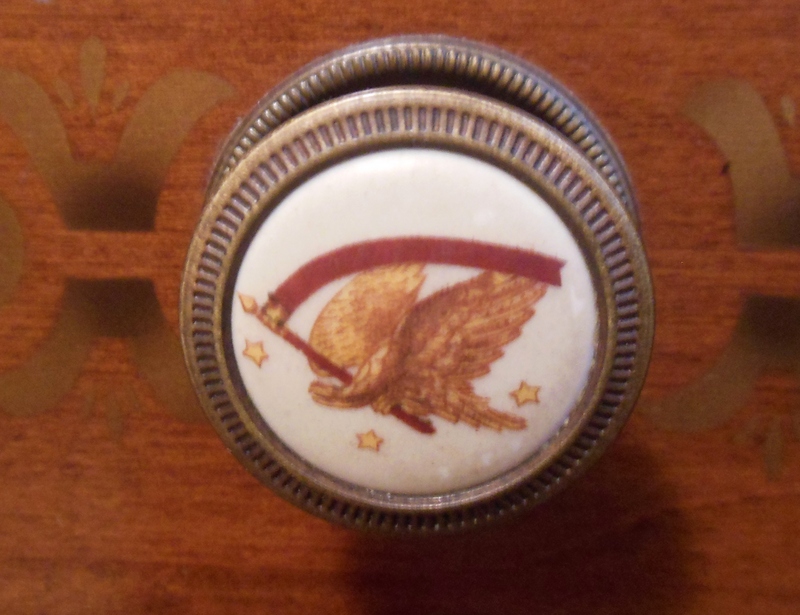 To replicate the expensive brass insets and elaborate filigrees that were so popular on the imported French furniture of the day, early-19th-century American craftsmen relied on less-costly stencil decorations. 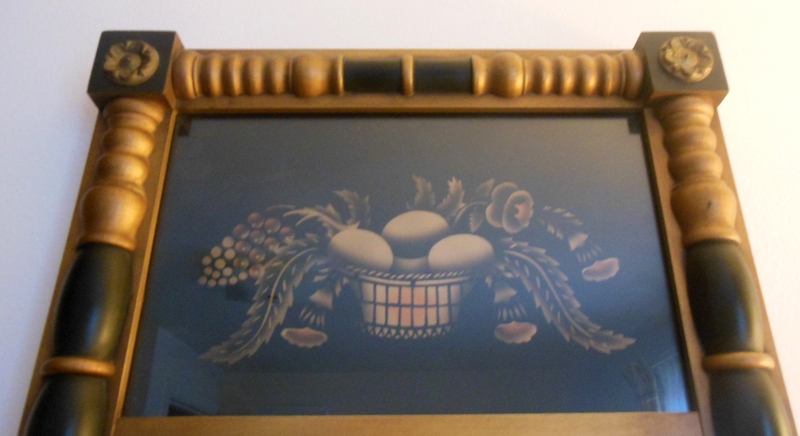 Lambert was a businessman rather than an artist, so he employed gilders to do the stenciling. They applied bronze powders of many different colors with a tin stenciler’s puffer through a series of pierced stencil overlay patterns made from architects’ linen. The luminous powders adhered to a tacky varnished surface to form a design with attractive depth and shading. Popular stencil designs included honeysuckle patterns, egg-and-dart borders, and the eagle, which was adopted in 1782 as the official emblem of the United States. A bowl of fruit containing stylized grapes, melons, peaches and pears, with floral sprays on either side, was especially favored by Hitchcock customers. Paintings of landscapes or familiar farm scenes also adorned the backs of some Hitchcock chairs. Once the piece was stenciled, another craftsperson striped and banded it to frame the design and accent the piece’s contours. Using a quill and yellow ocher, black, or umber paint, the artist made one long stripe, then quickly passed the quill from one hand to the other and made another long connecting stripe. 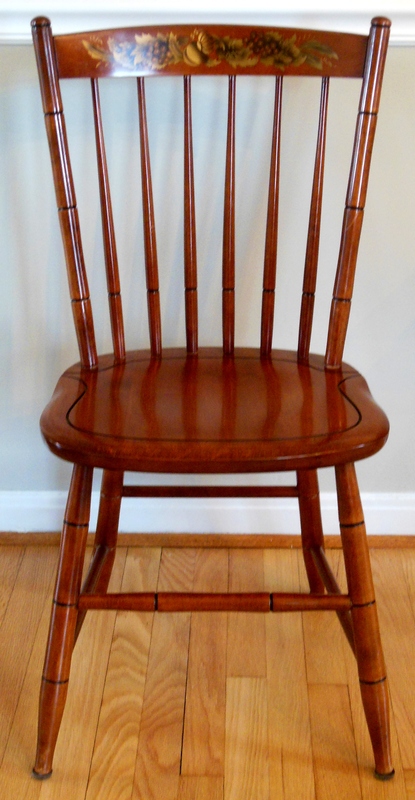 To meet New Englanders’ demand for Windsor chairs, Lambert also made these functional, traditionally English chairs with spindle backs. 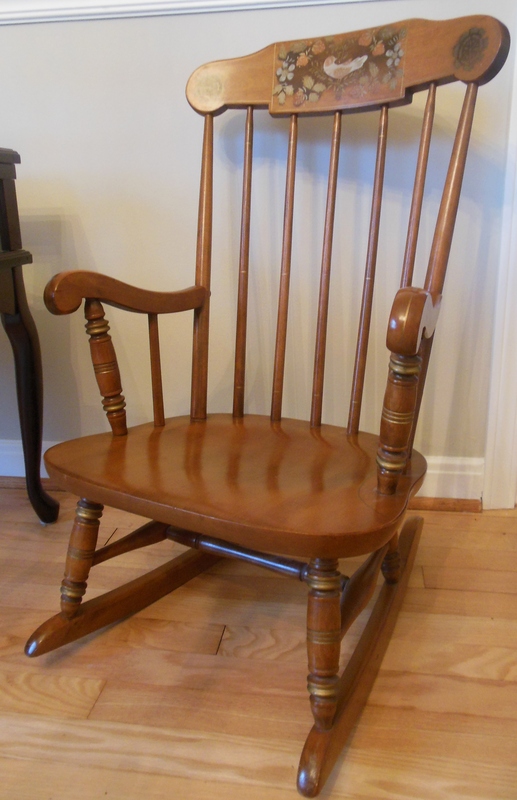 Additionally, he popularized the Boston rocker, with a high spindled back topped with a decorative panel, arms, and a seat that curves downward at the front. All Hitchcock chair seats were either made of wood, cane, or rush, a durable material hand-woven from cattail plants harvested in the late summer from nearby swampy, muddy areas. Weaving rush is such exacting work that only about three seats could be completed a day. As Lambert’s fame as a chairmaker grew, the citizens of Barkhamsted renamed the village Hitchcocks-ville in his honor. He was so confident in his products that he decided to sign everything that was produced in his factory. A stencil was created that read “L. Hitchcock. Hitchcocks-ville. Conn. Warranted.” The “N’s” were stenciled backwards by mistake, but it remained because stencils were too valuable to discard. Although Lambert’s assembly-line techniques and merchandising ideas were revolutionary for his day, financial and transportation challenges led his business to go bankrupt in 1828, and it took three years to pay off his creditors. After Lambert died in 1852, his business changed hands several times until the factory closed. In 1865, the similarity between the names of Hitchcocks-ville and Hotchkiss-ville, another Connecticut village, caused so much confusion in the stagecoach postal service that Hitchcocks-ville’s name was changed to Riverton. In 1946, a shoe-store owner named John Kenney came to Riverton on a fishing trip, discovered the old Hitchcock factory, eventually bought it, and built a very successful business creating and selling new furniture replicating Hitchcock designs, creating the bronze-powder stencils with an airbrush and a series of brass stencil patterns with registration points and overlays so that every stencil would be placed in the exact position needed to create intricate, shaded designs. Several Hitchcock reproduction pieces, including a child’s rocker, a mirror, a dresser, a bed headboard and footboard, a kitchen table and four matching chairs, furnish my home. After Kenney died in 1983, the Hitchcock Chair Company experienced more difficulties, and its factory, wholesale business and associated retail stores eventually closed in 2006. 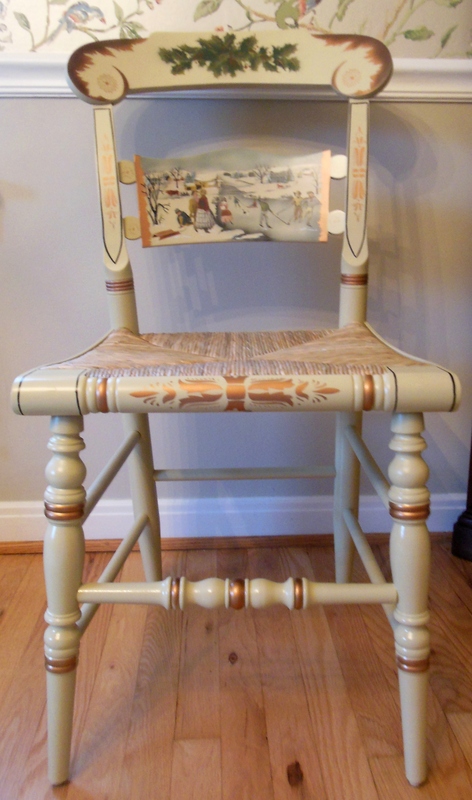 In 2010, new owners purchased the Hitchcock name, plans and artwork, and the Hitchcock Chair Company began creating Hitchcock chairs, tables, benches, mirrors, occasional pieces and limited-edition selections in Riverton once again. This past Christmas, my parents gave me a limited-edition Hitchcock Signature Series Christmas chair that was first offered in 1975. Finished in white enamel, with a hand-crafted rush seat, the chair features a hand-stenciled “Winter Wonderland” scene on the main back-slat, which also has a button back. It has holly stenciling on the top-rail, bronze-powder decorative stenciling on the front-rail and side posts, and gold striping on the knobs and the fronts of the legs, just like Lambert’s craftsmen did. It was finished just days before Christmas. Peggy and Mary would love it. To learn more about Hitchcock chairs, read The Hitchcock Chair: The Story of a Connecticut Yankee – L. Hitchcock of Hitchcocks-ville – and an Account of the Restoration of His 19th-Century Manufactory, by John Tarrant Kenney; Hitchcock Chairs, by Mabel Roberts Moore; and How to Restore and Decorate Chairs, by Roberta Ray Blanchard. Excellent article. I appreciate learning something new about furniture, especially American created and crafted.